Google recently announced plans to bring its 1Gbps fiber service to Kansas City, Kan. and Kansas City, Mo., targeting consumers. The company has divided the cities up into “fiberhoods.” In order to be eligible for the service, the majority of the residents in an area must be ready to sign up for the service. After a $300 installation fee, they’ll be speeding along at data speeds much faster than neighboring areas for a fraction of the cost. 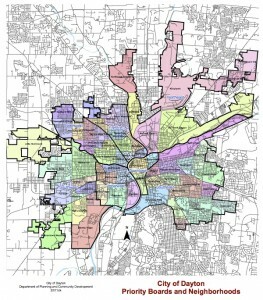 Extra Mile Fiber plans to use this same process of separating the Dayton region by fiberhoods and prioritizing the buildout based on commitments from residents. As the majority of residents indicate their commitment to signing up for the fiber service to their home, Extra Mile Fiber will start the permit and construction process for their fiberhood. Over the next few months, an interactive map showing the Dayton region separated into fiberhoods will be developed and posted on this website. If you are a resident of the Dayton area and are interested in signing up for fiber service to your home, you can comment on this post or contact the author directly, or you can check back to the site for the interactive map. Google’s KS launch also created a “Digital Divide”; some neighborhoods signed up in droves, while other residents to the east scarcely did at all. The parts of the city already running on Fiber are turning to gold, but there are many neighborhoods that Google Fiber isn’t likely to reach. In November 2012, the Hanover Heights neighborhood, southwest of Troost Avenue, became the first one to connect to Fiber. Dozens of entrepreneurs flocked there right away. Startup Village, a startup incubator in that neighborhood, was founded by four entrepreneurs who met in Hanover Heights after Fiber arrived. Google Fiber offers amazing Internet and TV packages to many residents of Kansas City, Mo. But for those on the wrong side of the digital divide, “Connecting for Good” and others provide much-needed access for the areas Google does not reach. covers how “Connected for Good” (socially-minded geeks with missionary zeal) became its own ISP and provided free wireless service to 500 Kansas City families in two large housing projects and one senior-living home. And they provide the needed computers for residents to use with the new internet connections. The Kansas City model could change this. The town’s Internet access beats the service offered in major cities in two areas: speed and price. Would love to see fiber in Forest Ridge. May I submit an article for our neighborhood newsletter, the Murmurs, about this website? Members of Dayton Microcomputer Assoc. would be very interested in fiber coming to Dayton. Is there any chance you might speak at one of our meetings this fall? I could put out a blast to several local tech organizations and try to pack the meeting. I would be thrilled to have another alternative for high-speed Internet in my area (Dayton View Triangle). Best of luck to you! Grant, thank you for commenting last month. We announced that the Water Street District will be our first location for fiber broadband with gigabit speeds. Our team is working with Dayton and other communities to develop a strategy for building out fiber broadband to all communities in Montgomery County and Greene County and other areas of the Dayton region. Please like our Facebook page and follow our Twitter to stay informed. We also have a newsletter signup on our webpage. I recently cancelled my cable television but only have one option for highspeed internet. I would love another option. One half of my neighborhood in Bellbrook is only two years old and the other half is currently being developed as I make this post. Chris, you have joined the ranks of cord-cutters across the country. Extra Mile Fiber will be another option for you in the not-too-distant future. At this time, we hope to support and educate communities about over-the-top options for television. Options like Netflix, Hulu Plus, and Amazon Prime are gaining popularity. Devices to stream video content are improving. Fiber broadband and gigabit speeds will make the quality of such services immensely better than the high speed options available today. Bellbrook is another area of Greene County on our radar to get fiber broadband service. Tom, welcome to the Dayton region. We feel your pain regarding high speed options. We plan on offering gigabit speeds for between $70 to $85 per month with options for lower speeds at lower prices. Our team has been speaking with Greene County and will continue to develop plans to build into Beavercreek and other areas. In dayton near Belmont area. I’d rather pay for high-speed fiber than the exorbitant low speed that att delivers. Thank you, Michele. Please sign up for the newsletter on our website to stay informed about where we are building and how to get your neighborhood included in our future fiber construction plans. I work for the City of Dayton and I am very interested in getting gigabit fiber to my home. I am in the Kettering area and would love to hear more. Would you be willing to spread the word about fiber broadband and the benefits it can bring to Trotwood? If so, we can help with material or presentations. Come down to West Carrollton! I’m in Kettering, I work in IT and I would love to have a fiber internet access here. Is there an availibility to speak at a township meeting in Harrison township? Please let me know. Fiber in Dayton would surely help this city. It would be absolutely amazing to have Fiber in the Centerville area. Currently we only have Time Warner or DSL to choose from the the price for performance is terrible. The download speeds aren’t awful but the upload speeds are absolutely terrible. I would be more than happy to pay for Fiber and cut cable altogether. I’ll be definitely signing up for the newsletter! I’m interested, but would like to see a cost estimate before committing to anything. I do not own my home, so if there is any work I need to do there, I would have to talk to my landlord, but if you’re able to serve my residence as-is, then I’m definitely interested in becoming a subscriber. There seems to be a distinct lack of any news on this service. Is there any more news to share? You are absolutely right, and we thank you for your patience. We have made some progress in working with Dayton leadership, but have not made any formal progress. Most of our attention has been focused on ensuring Water Street is successful. We hope to expand into several more areas of the Webster Station neighborhood. Besides this, we hope to have more updates as they occur. We just wish things were progressing more quickly. It appears that several residents of Huber Heights have expressed their desire for fiber broadband to the city leadership. We plan to meet with them over the next few weeks to gauge interest for Huber Heights residents. This is a very early stage in a process that can take quite a bit of time. The more interest expressed from residents the better. I see this was posted over a year ago is there any progress to report for Huber Heights? No progress in that direction. There is plenty of demand for higher speeds and for fiber, but the expenses to construct the network are very significant. Thanks for your comment. Belmont is definitely on the radar at some point in the future. There are quite a few homes. I used to live there and really enjoyed walks through the neighborhood. Please follow us on social media or sign up for the newsletter to stay informed. It may also help to spread the word and start growing interest within the Belmont neighborhood. Please send me some info. I will forward it in decision makers hands in the Northmont schools area. It is good to hear from you. What kind of information would you like to see? It is much better to do an informal presentation where there is time for questions and answers. I would love to have another option for high speed internet in Bellbrook! We built our house 8+ yrs ago, and nobody wants to come in and compete with Time Warner. Thanks. We would love to build fiber to homes in Bellbrook. Would anyone in the City of Bellbrook leadership be interested in meeting with us to discuss how to make that happen? Thanks for your comment. It has been too long since we had time to blog and get the news out. Your neighborhood has some really nice homes and is certainly an ideal area for more fiber broadband. Do you have access to both cable and DSL where you live there in Harrison Township? Does the City of Dayton have one or two spare fiber strands reaching from downtown up to your neighborhood? That is all it would take to reach you and start generating enough interest to design and build to every home. In this fashion, we would need a place to put some equipment for the neighborhood as well. We do in fact have Spectrum/Time Warner 70Mbit connection as well as U-verse 45Mbit in our house. We literally are the street behind the new library off of Philadelphia at the end of Sunnyview Ave with people who care about their homes, Hook Estates off of Philadelphia that backs up to Sunnview Ave as well with some Million dollar homes directly behind us. I can see Good Sam hospital from my yard and it’s a 3 minute walk away. A Company called Brock was running the fiber all the way up Sunnyview Ave. to my pole right literally 10 feet behind my house then over behind Hook Estates a few days ago, and then over to the Hospital. The Brock contractors I talked to said how easy the job was and they are the ones doing the hard part. I talked to them for two days in a row while they were parked in my driveway. The equipment as long as it was not imposing could be put in the corner of my yard or somewhere if it was down to that part as long as it was not that imposing and I got a fridge benefit 🙂 lol. There is a piece of land uncut and un-used that surrounds the Library that has a walk through to Sunnyview if someone could work that out. I am a struggling Indie Game Dev for Sony PS4, Nvidia, Samsung and others as well as a household full of competitive gamers/streamers that would greatly benefit from this type of connection. We also have started a non profit STEAM school project to bring California/Silicon Valley style tech learning here that we have tried in vain for nearly 30 years. We were ahead of the creative thoughts curve for much of that and could use Fiber for that as well when it finally gets up and running. If you think it is a real possibility, which would excite us to absolutely no ends, you could pass some voice contact info along for you and discuss with my better half lol with the particulars of trying to make this a reality finally. We have waited for years and the people like us are tired of trying to play catch up with the rest of the fiber world. Our email address is attached for you to request our tele number or pass yours along. Thanks for the response, really thank you. Thanks and totally understand your excitement. Attachments do not appear to come through, so I ask that you send email to our support group to start a ticket on this. Support email is support@extramilefiber.com. If that does not work, please contact our office at 937-660-7128. Count us in in West Kettering. You will not have much competing wit Spectrums prices and LOW speeds. You will corner the market. Please consider West Kettering at your earliest convenience. Thanks! Thank you for the comment. We are currently limited in availability to a portion of downtown Dayton, but have plans to expand. West Kettering would be great. Kettering and Oakwood area! Two school systems that would benefit from those high speeds! I want services in Kettering as well. Spectrum doesn’t let me get what I want for a decent price. And they are my only option to get the speed i want. We hope you can get out here soon. Thank you for your comment, Maria. We would love to bring our services to Kettering and will work on getting some interest and cooperation from the Kettering city leadership.